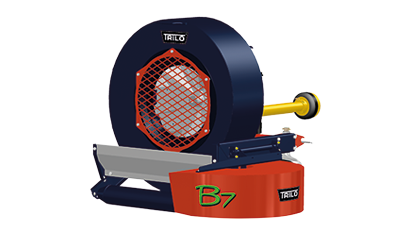 Thanks to its great power de TRILO B7 has a long reach and blows clean large areas in little time. The reverse exhaust spout is hydraulically adjustable from the driver’s seat, which makes it easy to operate. When changing the direction of travel and driving back again, you can still blow in the same direction with help of the reverse exhaust spout. You can blow on the left and right of the machine. If you set the exhaust spout to half-height, you can blow on both sides in one pass and you can clean your paths and roads in one go. The large gauge wheels and anti-scalp roller ensure that the leaf blower perfectly follows the contours of the ground and it protects both the exhaust spout as well as the turf. The fan is driven by a PTO drive shaft attached to the tractor and requires an output of 30 HP (22 kW). • Compact and lightweight with high power. • Adjustable gauge wheels and anti-scalp roller. • Reverse exhaust spout is operated hydraulically from the driver’s seat.